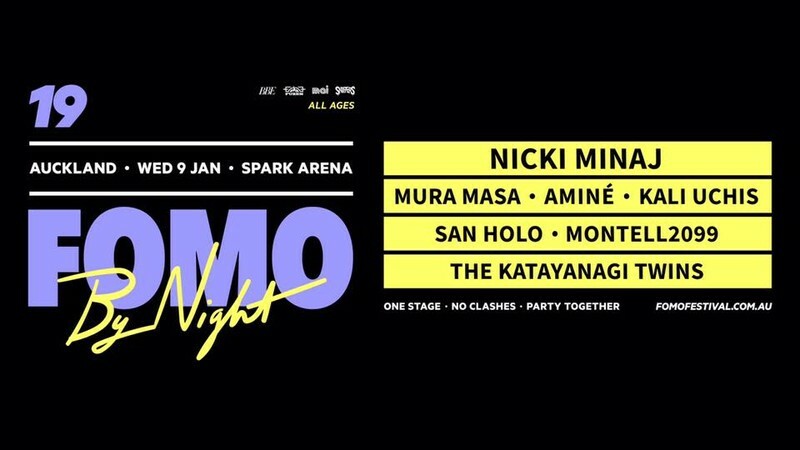 Following last month’s mammoth line-up announcement, Australian summer festival favourite with no clashes Fomo today reveals their hugely successful Fomo By Night is coming to New Zealand in 2019. 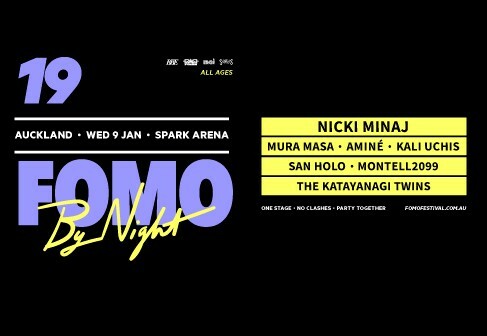 Nicki Minaj, Mura Masa, Kali Uchis, San Holo, Montell2099 and The Katayanagi Twins are set to perform an All Ages show in Auckland on Wednesday January 9 at Spark Arena. Leading the bill is Fomo headliner and superstar MC, Nicki Minaj. One of the world’s most influential hip-hop artists and undisputed queens of rap, Nicki has set up residency on music charts worldwide, collecting Billboard Music Awards, BET Awards and numerous Grammy Award nominations along the way. Renowned Portland rapper Aminé has charged into the worldwide spotlight in 2018, releasing single “Campfire” before a surprise sophomore LP Onepointfive, featuring the triple j adored single “reel It In”. Since breaking onto the scene with “Caroline” and “Spice Girls” from his debut album, Good For You, crowds worldwide have loved the rapper’s infectious charisma and flawless style. From performing on The Tonight Show with Jimmy Fallon and landing a Coachella slot, Aminè today proudly steps onto the Fomo tour, adding an extra stop for adoring fans at Auckland’s Fomo By Night. Multi-instrumentalist and producer Mura Masa will give night goers a dose of his signature tropical-inflected house, including catchiest disco number of the year, “Til The World Falls” with Nile Rodgers, Chic and Nao. Adding to the pack, is Dutch electronic connoisseur San Holo, whose experimental finesse will fill the Arena with creatively daring EDM. Fearlessly creative Los Angeles-based artist, Kali Uchis adds her own flavour to the night. Hot on the release of her album Isolation, Kali heralds a series of guest features prior to Isolation that have seen Grammy nominations, including collaborations with Gorillaz and Tyler The Creator. Her self-determined sound has won respect from peers and fans alike as a singer, songwriter and director of her artistic identity. Rounding out the Auckland lineup will be New Zealand’s own beat maker, and 21 Savage collaborator Montell2099, alongside fashion-forward DJ duo, Kayatanagi Twins. Bringing a huge selection of homegrown and world-class international talent the Fomo By Night lineup, be sure to stay across further updates to come.